Wouldn't it be great if we could all pencil in a day at the spa together? We could finally meet face to face and chat over manicures, gab during facials and giggle in the midst of pedicures. Hmm . . . that would have to one pretty big spa! 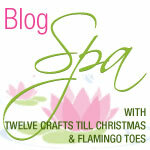 Well, since we can't do that, Bev (of Flamingo Toes fame) and I want to welcome you to Blog Spa . . . you've spent a year taking care of others, making gifts for others, doing for others . . . this week is about taking care of you. We will be offering our own tips and tutorials plus giveaways from some great shops. So stop by every morning this week for a great giveaway and every evening for a spa tip or tutorial. To start off our Blog Spa I want to introduce you to a great Etsy store . . . Skin Journey. Skin Journey provides a line of quality spa products for body and facial care. Plus, I love that Skin Journey carries sample/travel sizes as well so that you can try out a variety of products to see which one you like before you commit to a full-size product AND then get your fav products in travel sizes . . . woohoo. To kick off Blog Spa, we are giving away a Basic Facial Care Set from Skin Journey. ~Tell me about your skin care routine. ~Be or become a twelve crafts follower . . . and PLEASE don't just follow for the giveaway and then unfollow once the giveaway is over. I know that might sound rude, but seriously, if you don't want to follow, don't . . . I won't be mad. There are other ways to enter. ~Be or become a follower of the Flamingo Toes. ~Visit Skin Journey and let me know your favorite product. ~Heart that product on Etsy (add it to favorites). ~Heart the shop on Etsy (add it to favorites). ~Let me know if you have our cute Blog Spa button up on your blog. i don't do much - just wash my face with water! i could probably use something else and would love to try this stuff! I follow you through my google reader. I also follow Flamingo Toes (where I heard about this giveaway) through my Google Reader. Well, I use mineral makeup - which in and of itself is good for your face. I also use an organic moisturizer with vitamins and minerals in it (I bought it at TJMaxx for super cheap!) Thanks for the chance to win - I'm a massage therapist, and so I think blog spa week is a great idea! I am a follower of yours already....and am so excited about this spa week! Not much is done, I wash my face in the shower with either dove, Biore, or just plain water. On the days I don't shower I still rinse my face off withwarm water. I've also been a follower of Bev's at Flamingo Toes. I added the shop to my favorites. I wish I could try all their products. I also added the Microdermabrasion Facial Scrub- with shea butter, alpha hydroxy acids, renew old skin cells to my favorites. I follow Flamingo Toes too! I wash my face with Aveeno in the morning and at night. During the day I wear lotion with SPF in it and at night I have a night lotion-Murad brand. Since I'm preggers, my skin has been going crazy and nothing seems to be working. I'm so excited about this giveaway!!! I just started using proactive.. not because I have break out... but because I thought I should start some sort of routine. HA! My skin is SO dry I use Eucerin cream in the morning under my foundation. I just added Skin Journey to my etsy favorites! I like the Avocado and Chamomile Facial Cleanser. Right now I don't use anything and it says it's gentle on the skin. Sounds great! moisturize, moisturize, moisturize...that's my facial routine. the Squalane Body Oil looks really interesting.....fun site...and I love the idea of sample size. My mother had the softest skin I have ever felt and she was a long time Oil of Olay user. I have tried many different types, but the whole routine thing is just beyond my time management skills! So, I wash my face in the shower with Oil of Olay facial wash and then moisturize my eye area with their eye serum and the rest of my face gets the Total Effects Moisturizer. That is it! I hope my skin stays as soft as Moms was! I wash my face most of the time with just water. I use Clinique lotion of Olay of Olay. Sometimes at night I use vaseline at night around my eyes. I have a friend that used it all over her face at night and she has no wrinkles. I am needing a change. I would like to try the Tropical hydrating lotions. Of course, I'm a follower! I LOVE your blog! I also follow Flamingo Toes. I recently discovered Murad skin care and it works very well for those with acne prone skin. First I use baby oil to remove all eye makeup. Probably not the best thing to use, but it is cheap. Then I use Burt's Bees Radiance facial cleanser with royal jelly. Next, I tone with Clean/Clear toner and follow with Johnson and Johnson moisturizer. I'm a drugstore girl. Love this idea!! I'm a follower of Twelve Crafts. I'm a follower of Flamingo Toes! I would love to try the Detox Clay and Milk Masque... sounds like it feels SOOO good!! I "heart" the Detox Clay and Milk Masque on etsy! I love the Republic of China soaps! There is nothing like homemade soap! I "hearted" the shop on ESTY! I love all the body scrub. I use Clinique acne line of products. I love it but its pretty pricey so it would be great to try something else. I usually just wash my face with water, and sometimes I use some body wash, but not often because it would dry out my skin. Then I put some olay lotion on my face. Very very rarely, I have been known to do a mask, lol. I am a new follower, can't wait to check out your blog some more! Lotion, lotion, lotion! That's my trick! I hearted skin journey's shop on etsy! I'd love to try to detox clay and milk mask. I'm a loyal Twelve Crafts follower. :) Thank you for the opportunity! I'm a loyal Flamingo Toes follower. :) Thanks again! My goodness that Peruvian Chocolate/Shea Butter soap looks decadent and lovely. Oops, I missed the first entry, which is to tell about my skin care routine. I wash my face daily in the morning shower (I don't wear makeup, other than a little mascara now and then, so I don't wash my face in the evenings). I use Aveeno Active naturals clear complexion cream cleanser and after my shower I use Aveeno Active Naturals Positively Radiant Moisturizer. It's SPF 15. If I am going to be outside all day (I work in Parks and Recreation), I use an additional moisturizing sunscreen. I favorited the Peruvian Chocolate-Shea Butter Cold Process Soap on Etsy. I favorited Skin Journey on Etsy. I wash my face with Angels on Bareskin facial scrub and then follow up with eau Roma water toner. I finish with a good slathering of Skins Shangri La, an uber moisturizing facial cream. All my products are from Lush handmade cosmetics! I follow Bev at flamingo toes! You bet I have your button!!!!! My skin care routine is non-exsistant. I wash with soap and water and then put on a mosturiser. I'm a 12 crafts follower! I'm a Flamingo Toes follower! I would like to try the Caribbean soap, I love great soap and I never know what to do with all that fancy stuff. I hearted Skin Journey on Etsy! I wash my face with wash every night and just wipe it with a wash cloth in the am because my face is dry. I put on day lotion with spf in the am and night lotion at night-oh and I use astringent. I have combination skin so it's a mess! I am already a follower of 12 Crafts! I am already a follower of Flamingo Toes! I follow 12 Crafts Til Christmas! Ok, my skincare routine- I'm a woman who had good skin in high school and now has high school skin in her 30's- GRRRR. I wash with neutrogena cleanser morning and night and use (right now) YES TO CARROTS moisturizer. I wear no make-up except mascara because it seems to make things worse. I'm open to trying anything in the hopes it will help. I've been a follower for several months now, love all your great craft ideas! I visited Skin Journey- I'd love to try their Detox Clay and Milk Masque. I wash my face every morning and night. I use lotion every morning (with spf) and at times at night...if I'm dry. I also use body lotion daily...mostly my hands, also my legs. And yes, I'd love a spa day...never had oen! I already am a twelve crafts follower, Love your site! I made the Boston tea party soap my favorite. It sounds lucious. My product I would love to try is the Curacao, Netherlands Antilles Body Scrub (10oz) and Whipped Body Emulsion (9oz) Gift Set. I have been a follower of Flamingo Toes on Google reader for a while now. Great blog. I hearted my favorite product. My routine is to wash my face in the morning shower then put on moisturizing lotion and foundation with spf. I am a follower of 12 crafts! I add Skin Journey to my favorites on Etsy. I favorite would be the anti aging skin serum sample kit to try. My skin care routine... Gets more complicated the older I get. I use whatever eye makeup remover that doesn't burn my eyes or give me dry, yucky skin around my eyes. I wash with Kirkland's facewash and moisturize with either Equate's version of Oil of Olay or Kirkland's in the morning, both with SPF. Kirkland eye cream day and night, and Kirkland night cream (at night, of course). And, I try to remember, once a week to do some sort of masque/exfoliating step. Hard to remember. I look forward to reading all your tips for spa week!! My face is pretty picky about what I use on it, I would love to try some of skin journey's items. Most all natural stuff is very expensive but this stuff seems right in my price range and I love that they have sample and travel size. I can tell you how many times I have wasted my money on something that didn't work for me and then I'm left with this huge bottle! Thanks for introducing their etsy shop to me! I pretty much wash my face in the shower and that is it so I guess it's not really a routine. I use Mary Kay products right now but would love to try something else. I also am a follower of Flamingo Toes!! :) I love both of y'alls blogs! So crafty! Added "Skin Journey" to my favorites on Etsy! I would love to try their Florida Keys Hydrating Body Scrub! It looks so lush... and sounds like it smells divine! I use Peter Thomas Roth botanical buffing beads in the shower every morning and Philosophy face wash at night. And I follow flamingo toes. I usually wash my face with facial cleanser when I shower/bathe at night (yep, I'm a night bather). Then, when in bed, I put on a night moisturizer. I am a follower of 12 Crafts. I usually wash my face with hot water and a face soap every night. I'm a twelve crafts follower. I'm a Flamingo Toes follower. I would love to try the Microdermabrasion Facial Scrub! I'm a follower, and really enjoy it! I think the anti aging kit would be great! i have the WORST routine! most days i dont even get to wash my face all day! when i do get to, i start with plucking my eyebrows, then i wash my face, then i moisturize. i heart the shop on etsy! i would love to try the hydrating body scrub 2 in 1 with cocoa butter and avocado oil! i added the body scrub to my favorites! I am a follower of twelve crafts! I am a follower of Flamingo Toes! My favorite item at Skin Journey is the Avocado and Chamomile Facial Cleanser. I added the item to my favorites. I added Skin Journey to my favorites. What a great give away, and perfect time of the year to do it. The cold harsh weather is really getting my skin dry and rough. I do not have any real routine. Loved finding out about this etsy shop! Have a blessed day! I'm already a flamingo toes follower. And I giggle ALL the time when i say that. flamingo toes. my routine is pretty easy. wash my face at night and put cream on and then in the morning just rinse with water and put spf on! wash with an everyday scrub type product in the morning and at night. Moisturize in the morning and night as well. just went to visit Skin Journey. I want one of everything!! If I had to pick it'd be the Garden of the Forbidden Gods soap or any of the body scrubs. Wash my face, lotion, eye cream! That is it. I follow your blog. thanks for the chance to win. I wash my face with water in the mornings, after work I use Melaleuca face wash & astringent (but I no longer buy from them, this is my last bottle! ), and before bed I use moisturizer. A lot of their stuff looks awesome, but I think the "Bright Eyes Anti-Oxident Serum" is my favorite. For 23, I have horrible undereye circles and not much that I've tried has helped! Added product to my Etsy Favorites! I'm not the best at skincare but I make sure my face is clean and moisturized, and try to use facemasks every once in a while. I feel I should take better care of my skin and would love to win! What a giveaway! My routine is pretty simple: wash with a mild cleanser twice a day followed by some tinted Neutrogena moisturizer and L'Oreal's mineral face powder. Once a week I'll try to thoroughly exfoliate and use a mask if I can find the time. I'm a follower of Flamingo Toes. I visited the shop and their lip conditioner looks fab! I love that they have cotton candy as a flavor/scent. I am in my mid-20s and my acne is worse now than when I was in high school. So, I wash my face in the evening with Clean and Clear and apply C&C spot treatment morning and evening. I use the neutrogena skincare line, but am actually looking for something new. This dry winter is doing a number on my skin! I am truly just a wash cloth with water face washer..i visited ur esty shop & the item i would purchase is e the Microderabrasion Fascial Scrub..looks wonderful. Added ur button to my blog. I usually wash my face with just water and follow up with jojoba oil as moisturizer. Every now and then I use coconut oil if it's super dry out. I follow you via email! This is such a great idea, thank you. I should do more since I have oily skin and prone to breakouts but I don't. Would love to win some good skin care products. I was my face with water that's it the life of a mom! I usually use aveeno products as my fall back, but I like to try new things sometimes. I'm not really married to one thing though! I'm a happy flamingo toes follower!